Curtain Raiser. On August 23, 2006, ATP had a post on Bolan Pass, on November 2, 2006 another post on Chappar Rift and on December 18, 2006 yet another post on Khojak Tunnel. In the following we will discuss another famous pass railway of Pakistan i.e. The Khyber Pass Railway. Before we start on our journey, a word about the photograph below. 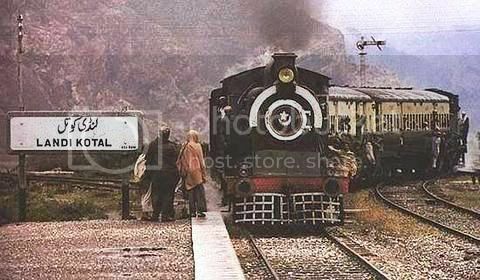 It shows the arrival of weekly Sunday passenger at Landi Kotal in 1975. 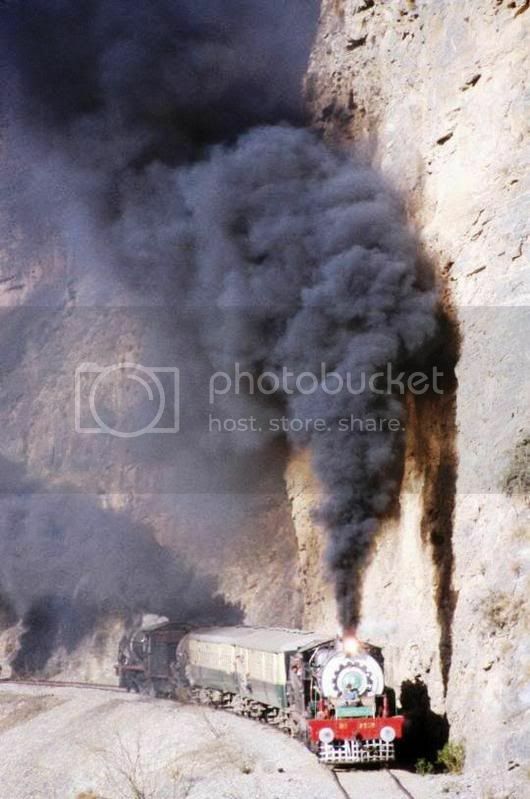 It is being pulled and pushed by two steam locomotives which signify the effort required in bringing this train from Peshawar, up the Khyber Pass to Landi Kotal. Departing Peshawar. It is 8:00 a.m. on a sunny Sunday at Peshawar cantonment. The Steam locomotive number 2216, which was built in 1916 by Kitson and Company of Leeds, UK is all set to start on yet another journey. The driver and fireman give one final inspection to the engine vitals and with a long whistle the number 2216 coupled to a tourist train pulls out of the station. Today the destination is Landi Kotal via Khyber Pass. The train gains speed and soon passes through Peshawar localities of Notia Gate, Swati Gate and Bara Gate. Since the track is now seldom used, there are vehicles parked very close to the track. Many children run along and clap as they see the approaching train. Across Peshawar Airport. After crossing Bara Gate the train slows down and ultimately comes to a full stop. In front of the locomotive lies the 9000 ft long runway of Peshawar International Airport. The train now waits for clearance from the airport control tower before it could move. Sometimes the clearence comes over the phone and sometimes the train crew has to personally walk to the tower and get clearence while enjoying cup of tea with the tower staff. Peshawar is the only international airport in the world where a rail track crosses the main runway. 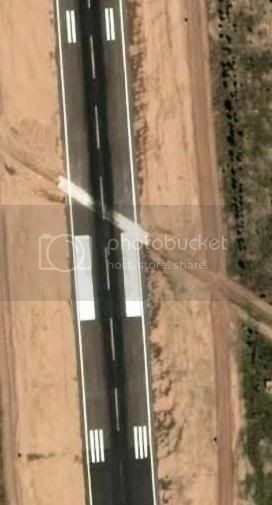 The small photo above is the satellite image of Peshawar airport’s main runway. The diagonal path crossing the runway is the Peshawar – Landi Kotal rail track. After clearance is received from the control tower, the train chugs forward. To Jamrud. After clearing runway the train passes through the localities of University town, Kacha Garhi and Hayatabad. The famous 1756 km long Karachi-Torkham highway N5 comes closer to the rail track and both start traveling in parallel towards Jamrud. Located 18 km west of Peshawar, Jamrud is the gateway to Khyber Pass. The train reaches Jamrud in a less than an hour and and after a short stop continues its journey westward into the Khyber Pass. While the train is slowly steaming through its 3 hour journey towards Landi Kotal, how about if we take a little detour and cover the history of railways in Khyber which spans about 150 years. We will catch the train again as it will be entering the Landi Kotal platform around noon. History of Khyber Pass Railway. Let us start our tour from the year 1857. The “Great Game” is being played between the World powers on the chess board of central and south Asia. Russian influence is present in Afghanistan and British think there is a big possibility of Russian invasion into India. The most obvious routes for this possibility will be either through Khyber or Bolan Pass. Therefore it is suggested that strategic railways be built in both of these passes to thwart any Russian invasion. In 1878, second Anglo-Afghan war (1878-1880) takes place and it makes it all the while more important to lay a railway track through western passes of India. In 1879 a reconnaissance survey is conducted with an aim to find the feasibility of laying railways through Khyber Pass. Many years pass without any action on the ground. Finally the construction starts in 1905 from a place called Kacha Garhi between Peshawar and Jamrud. The track makes progress westwards and 32 km of track is laid by 1907. In the meantime, international situation changes and an alliance takes place between Russia and Afghanistan. Russia agrees to consider Afghanistan out of its circle of influence countries. This makes British consider Russia as no longer a threat. This also stops the work on Khyber Pass Railway. In 1909, several kilometers of permanent way and bridges are uprooted from Khyber Pass and sent to other areas of India to be used there. As it goes with the World politics, international situation changes again and the third Anglo-Afghan war of May 1919 brings life back to Khyber Pass Railway project. Colonel Gordon Hearn is now assigned to the work of surveying and recommending the best route through Khyber Pass. Until now all surveys recommended a meter gauge (1000 mm) track. Gordon Hearn proposes and demonstrates by a masterly survey that broad-gauge (1676 mm) line can be laid through the pass. Construction restarts in 1920 and the section from Jamrud to Landi Kotal, opens on November 3, 1925. 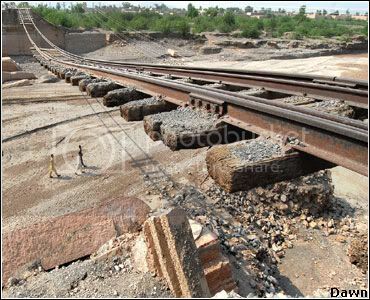 In early September 1925, several weeks before the railway was properly completed, the first piece of track was laid into Landi Kotal station, but the end spike was left out. Victor Bayley, the engineer entrusted with the construction of Khyber Railway has a 10 year old daughter called ‘Missy Sahib’ drove it in with 3 hammer blows. Then Bayley and his wife ‘Lady Sahib’ blew the whistle and drove the shunting engine pushing assorted wagons and a brake van into the station. This was a very low-key private affair, not officially sanctioned, and took place even before the extensive 10-track layout at Landi Kotal was put in. Bayley was in bad health at this time and left the Pass shortly afterwards for hospital and eventual convalescence in the UK. He missed the official opening ceremony with the Vice Regal train (but without the Viceroy) in November. The Inaugural Train though Khyber Pass. On November 4, 1925, Mrs. Victor Bayley, wife of the British engineer entrusted with the construction of Khyber Railway drives the first train through Khyber Pass. There are two stories as to why Mrs. Victor Bailey drove the first train through the pass. It was decided by the British government that Victor Bayley will run the inaugural train as recognition of his great work at the project but he died three months before the inauguration. His wife then honored the driving of train on her husband’s behalf. According to second version, as the track was being laid, the locals of the Khyber Agency did not allow the train to move on it. However, knowing the traditional respect the Pathans have for women, Victory Bayley, asked his wife to drive the first train in the Khyber Agency. It has been reported that she drew long hair so that she could be identified as a women from a distance. Landi Kotal to Landi Khana. On April 3, 1926 another portion of 8 km track is opened up to Landi Khana which fall just 3 km short of the actual frontier post of Torkham. The photo in sepia to the left is from April 27, 1932. 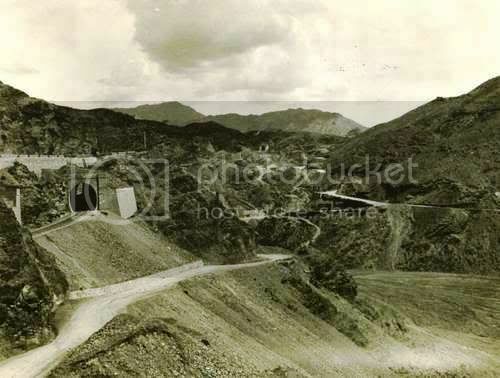 It shows a tunnel on Khyber Pass railway alongwith (now highway) N5 which runs alongside the track. On December 15, 1932 the Landi Kotal to Landi Khana section of railway was closed down at the insistence of Afghan Government. The Cost of Construction. The cost of building Khyber Pass railway was accounted as Rupees 485000 per kilometer in 1926. despite this exorbitant cost of construction, Khyber Pass has never seen heavy rail traffic. At best there were only 2 trains per week here. Scenery wise Khyber Pass is not an eye catch either but the feature that sets it apart from other railways in the region is the engineering aspect of it. Engineering Features. The Khyber Pass railway has a ruling gradient of 3 percent between Jamrud and Landi Kotal. There is a rise of nearly 2000 feet in 34 kilometers, and a drop of 872 feet in the next 8 kilometers to Landi Khana, where in many places the gradient stiffens to 1 in 25. There are 4 reversing stations, 34 tunnels with an aggregate length of more than 4 kilometers, 92 bridges and culverts, and 4 locomotive watering stations. And during the construction, three million cubic yards of materials mainly rock, were moved in the cuttings and embankments. Reversing Stations. Reversing stations are an important feature of Khyber Pass. Since it is not easy to bend a train here due to tight space, trains switch tracks and engines change their roles. The trailing engine becomes the lead and vice versa at the reversing stations. Catch Sidings. Besides reversing stations, track at numerous places is also provided with the runway train catch sidings. One such catch siding is shown in the photo on the right (above). The Khyber Railways is the last of the great railway constructions undertaken on the frontier during the British Raj. From 1947 onwards, Pakistan Railway continued a weekly passenger service through Khyber Pass. The service ran free of charge simply as a gesture to prove to the fiercely independent tribesmen that the line, in-spite of them, was open and the Pakistan Government was the boss. 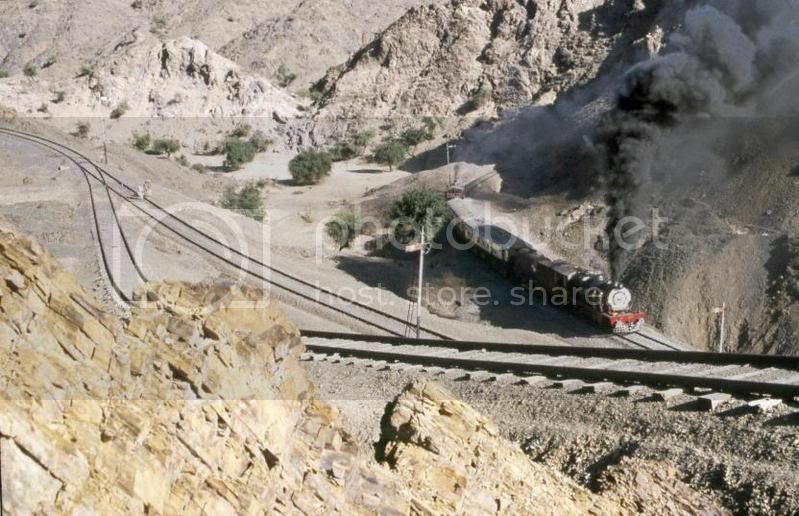 The regular service in Khyber Pass stopped in 1982 due to the lack of commercial patronage. Due to axle load limitations, diesel engines cannot run on this track. Therefore Khyber Pass railway to date is served by steam locomotion only. Khyber Steam Safari. At present a tourist train called the ‘Khyber Steam Safari’ is operated here by a privately owned tourist company. The train runs few times a year on scheduled days as well as it can be chartered too. 2-8-0 HG/S Serial # 2306 built Vulcan foundry in the year1923. Arrival in Landi Kotal. This completes the brief history of Khyber Pass Railway. It is around noon now. Let us now go to Landi Kotal station where our train which we parted in Jamrud is arriving. The station gives a festive look. The trains in Khyber Pass run seldom now therefore many locals have showed up at the station to welcome the train. As the train approached platform local children are seen running along it in excitement. Landi Kotal station is built in a very unique fortress like architecture. There are no windows or doors on the forbidding facade facing the platform. Distances and Altitudes in Khyber Pass. Considering Peshawar Cant as 0km, following table gives a view of distances and altitude of different landmarks along Khyber Pass Railway. Due to 2008 monsoon seasin rains in Khyber Pass, a historic bridge of Khyber Railway has wahsed away. Photo is below. Extensive damage to track also happened during rains of 2006 and 2007. The track as of today is closed for all rail traffic. We will update our readers if we get any news of repairs or status change. Chronology. As an appendix, I want to give the chronology of important dates regarding Khyber Pass Railway in the following. 1857: Chairman of Scinde, Punjab and Delhi Railway Company, Mr. William Andrew proposes rail routes through Khyber and Bolan passes. 1879: Sir Guilford Molesworth, an English Civil Engineer who was consulting for Indian government considered a survey of meter gauge (1000 mm) railway through Khyber Pass. 1885: Another survey was conducted by Captain JRL McDonald up to Landi Kotal. 1890: Captain JRL McDonald surveys another route to Khyber Pass following the gorge of River Kabul. 1898: One more survey was conducted to lay railways through Khyber Pass.1901: Broad Gauge (1676 mm) track is completed from Peshawar to Jamrud. 1905: Work started on laying an alternate meter gauge route following River Kabul into Mullagori hills. 1907: 32 km of broad gauge track was completed from Kacha Garhi to west of Jamrud into Loi Shilman valley. August 31, 1907: Britain and Russia decide on an accord in St Petersburg. According to this agreement Britain will not annex or occupy Afghanistan and in return Russia will not consider Afghanistan a country of influence. 1909: Kabul River Railway is abandoned as threat from Russia is considered very low. 1919: Third Anglo-Afghan war takes place. Col Gordon Hearn plans a broad gauge Khyber Pass railway from Jamrud westwards. November 3, 1925: Khyber Pass railway is inaugurated up to Landi Kotal. November 4, 1925: First train runs on Khyber Pass railway. Train is driven by Mrs Victor Bailey. April 23, 1926: Khyber Pass railway is extended to Landi Khana. 1926: Tracks were laid from Landi Khana to the border post at Torkham but a train never traveled on them. December 15, 1932: Landi Kotal to Landi Khana section is closed on requests from Afghan government. 1982: Regular service to Landi Kotal is suspended because of lack of commercial value. 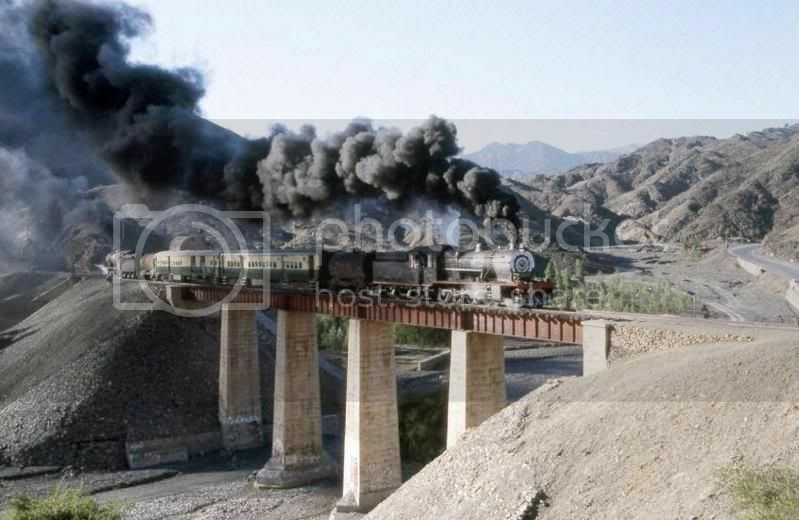 mid 1990s: A tourist train called ‘Khyber Steam Safari’ is started by a private enterprise in collaboration with Pakistan railways. This train is still in operation as of 2006. It runs on designated days a year and can be chartered too. Video of Khyber Steam Safari 2004. An amateur video of Khyber Steam Safari 2004 is here. Copyrights belong to the link owner. Dr. Roland Ziegler’s page on Pakistan tour of 1996 here. Mr. Malcom Peakman and Mr. Alex Jesserer for their anecdotes. I found this video clip on Youtube about Khyber Pass Railway. If you want to learn more about Pakistan Railways, then feel free to join the ‘Pakistan Railway (PR)’ discussion group. Everything and anything related to PR is discussed here e.g. preserving of Pakistan’s rail heritage, steam locomotives, sharing of photos and news, time tables etc. You can join the discussion group here. John, thanks for the info. you provided on last spike.